Check out these Bally Addams Family Pinball Machines for sale. You will also find parts and accessories for current owners including the Polar Bear Kickback, Cloud Topper, Cousin Itt, Playfield Plastics, Vault, Train, Phone, Knight, Target Set, Mods, and Custom Target Decals. 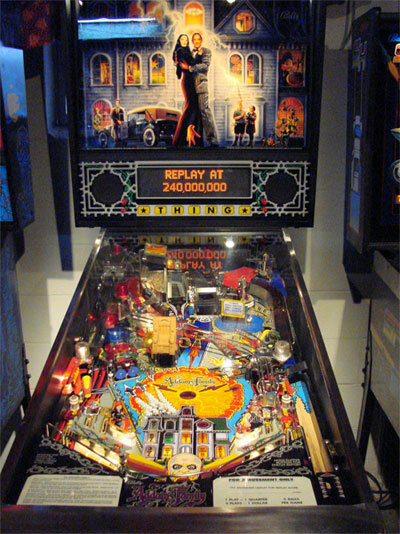 The Addams Family is hailed by pretty much all pinball enthusiasts as the best pinball machine ever designed. Operators love the machine because it still makes money in arcades. Collectors love the machine because of the movie tie-in and because it's so fun! There were over 22,000 machines produced--some in the original run in 1992, and more in a second run in 1994. Some of the 1994 machines were outfitted as "Gold Edition" collector's models. These machines had updated software (more sounds, more game play features), and lots of gold trim--legs, plunger, side art, etc.